Three years is a long time, but that is how long Papa would be away on the Lord’s errand. Now it is up to Eliza and the rest of her family to make sure the wheat is planted in time to reap a good harvest. But because Papa is gone this year, everyone else in Dry Creek has seedlings sprouting before Eliza’s family is able to get their crop in the ground. Will harvest time bring abundance or yet another hungry season? A beautifully illustrated tale based on a true story, Eliza’s Field of Faith shows how miracles sometimes happen in unexpected ways. I just bought this book and absolutely can't stop raving about it! My wife, and mother-in-law both read it and cried. I read it and cried. Wow. Amazing work Rachelle. Such symmetry and power in the prose! Thank you for sharing this book with the world! Bookstore catalog and saw your name! I'd seen a couple of your stories in the Friend. Congratulations!! hands on a copy when I go to the Cardston Bookstore next week. Lynnanne tried to track you down to no avail. But be looking for my comment. 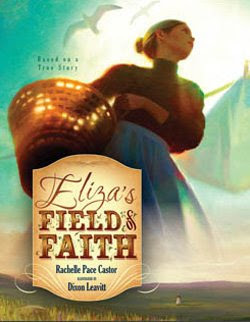 I read Eliza's Field of Faith this evening to my grandaughter and choked up several times when reading it aloud. A beautiful story with a beautiful message of hope and faith. Faith ALWAYS precedes the miracle, and miracles often happen in unexpected ways. It was a tender sharing time with my grandaughter and I look forward to reading it with her many more times. A tremendous lesson for her to internalize.